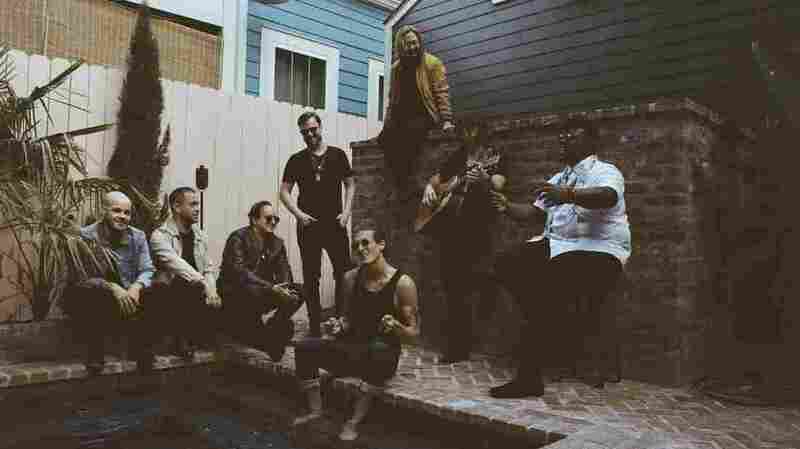 The Revivalists On World Cafe : World Cafe The New Orleans-based octet discusses the success of its song "Wish I Knew You" and shares Hurricane Katrina stories — plus, live performances recorded at Denver's Red Rocks Amphitheatre. If you've been to New Orleans, you know how easy it is to strike up a conversation with a stranger on the street. It just happens! It's also how the band The Revivalists was founded. The NOLA-based octet has been enjoying a lot of success thanks to its breakout single "Wish I Knew You," but its not an overnight success. The Revivalists got together in 2007 when Zach Feinberg and David Shaw had their own fateful, improptu conversation, which was immediately followed by an on-the-street jam session. Later, they added an unlikely set of transplanted musicians to their roster, and slowly started to carve out their niche. In this session we discuss the success of "Wish I Knew You," and the band shares its stories from Hurricane Katrina. First, though, a performance of "All My Friends," recorded live at Denver's Red Rocks Amphitheatre. Hear it all in the player above.